County of Orange RACES, an auxiliary communications unit of the Orange County Sheriff's Department (OCSD), is administered by OCSD's Communications & Technology Division. Members are registered as Disaster Service Workers with OCSD's Emergency Management Division. They are trained to provide voice, video, and data communications during emergencies, using their own equipment on County VHF and UHF repeaters and simplex frequencies. When activated, OCRACES provides emergency communications support, handles messages between incidents and the Emergency Operations Center (EOC), or between public-safety agencies and critical locations, and reports conditions from the field to the EOC or Command Post. The next County of Orange RACES meeting will be on Monday, May 6, 2019, at 7:30 PM, at 840 N. Eckhoff Street, Suite 104, in Orange. At this meeting we will review the May 4th ACS Radio Rodeo. On Friday, February 1, 2019, OCSD Emergency Communications Manager Lee Kaser, KK6VIV, and OCRACES Chief Radio Officer Ken Bourne, W6HK, discussed the Flash Flood Warning that was predicted for the next day, Saturday, February 2nd, and that, if it occurred, OCRACES should activate. Sure enough, the National Weather Service declared a Flash Flood Warning on Saturday. When that happened, Capt. Bourne contacted Assistant Radio Officer Tom Tracey, KC6FIC, and requested him to notify all members via AlertOC of an activation. Upon receiving his AlertOC notification of the activation, Radio Officer Scott Byington, KC6MMF, called Capt. Bourne on the OCRACES 2-meter repeater and asked what was required. Bourne said he was on his way to the Orange County EOC and needed one more member at the EOC RACES Room. Lt. Byington soon headed to the EOC. Activation announcements stated that flooding or emergency reports would be taken from OCRACES members in the field and relayed to the EOC Command Center from the RACES Room. However, OCSD Emergency Management Division (EMD) did not activate the EOC, but Bourne and Byington could have run any emergency messages to Control One if necessary. After a couple of hours, it appeared that weather conditions were not so severe that the activation had to continue, and therefore OCRACES was deactivated. On February 14th, NWS issued another Flash Flood Warning and the EOC activated to Level 3 (low level). OCRACES was advised that no response was needed until EMD elevated the level (which they didn't). All members were asked to advise of their availability in case of activation. In the left photo, OCRACES Assistant Radio Officer Bob McFadden, KK6CUS, ran 60 meters, using this pair of MFJ Hamsticks on a mast, at Dana Point. He also ran portable Winlink and checked in on 2-m and 70-cm repeater and simplex frequencies. In the right photo, Tony Scalpi, N2VAJ, set up this portable station at Belmont Park high in the hills of Orange. Using a yagi antenna, he successfully relayed simplex stations around the county to net control at Loma Ridge. Tony also operated 60 meters, using a homebrew vertical antenna. The City/County RACES & MOU ACS Exercise on Saturday, October 6, 2018, from 0900 to 1100 hours, was a deployment exercise to test alternate means of communications in case of repeater failure or inability to access the OCRACES repeaters on 2 meters and 70 centimeters from deep in the canyons or below cliffs in beach areas or even from some “dead spots” in cities throughout the county. 60 meters (channel 2) proved to be an excellent means of countywide communications during the drill, especially when repeater failure was simulated. Net control at the Orange County EOC communicated on 60 meters with portable OCRACES stations in Dana Point, Belmont Park (Orange), Irvine Regional Park, Silverado Canyon, Williams Canyon, Carbon Canyon, and Trabuco Canyon. Net control also communicated with portable city RACES stations in Cypress, Brea (Olinda Village), Huntington Beach, Laguna Woods, Newport Beach (Crystal Cove), and Westminster, as well as with American Red Cross. Portable stations in canyons and beach areas were also able to communicate with each other on 60 meters. N6WIX of Ventura County ACS provided a relay from Ventura between canyons in Orange County, when needed. Other City RACES units participating from non-portable locations included Buena Park, Fountain Valley, Fullerton, Laguna Niguel, Orange, Seal Beach/Los Alamitos, and Placentia. American Red Cross also participated. Six stations participated on DMR on the KA6P Santiago Peak repeater, Local-1 talkgroup. Seven OCRACES and City RACES members communicated via the Zello app on their smartphones during the drill. OCRACES members under the canopy include (left to right) RACES Lt. Scott Byington, KC6MMF, Martin La Rocque, N6NTH, and RACES Capt. Ken Bourne, W6HK. It was very toasty (105 degrees) at HRO Ham Jam on Saturday, July 7, 2018. Fran Needham, KJ6UJS, brought a nice canopy to provide shade to the other OCRACES members who participated and promoted RACES to many visitors who dropped by our booth. Ken Bourne, W6HK, set up a portable 40-meter station and worked Newport Beach, Laguna Woods, and Ventura with 20 watts into a pair of MFJ Hamsticks up 9½ feet. Scott Byington, KC6MMF, set up a 20-meter station with an Elecraft KX3 and a beam, and Tony Scalpi, N2VAJ, set up a 6-meter station. Also participating were Bob McFadden, KK6CUS, and Martin La Rocque, N6NTH. In spite of the heat, many visitors dropped by the booth and learned about OCRACES. Participation was very good at the Orange County Amateur Radio Club 2018 Field Day at the Walter Knott Education Center near Knott’s Berry Farm in Buena Park. Setup began on Friday, June 22nd, and operations occurred on Saturday, June 23rd, beginning at 1100 hours, and lasted until 1100 hours Sunday, June 24th. Stations in operation included 10 m/40 m SSB (Chip Margelli, K7JA, band captain), 10 m/40 m CW (Kenan Reilly, KR6J, band captain), 15 m/80 m SSB and CW (Tim Goeppinger, N6GP, band captain), 20 m SSB (Ron Mudry, W6WG, band captain), 20 m CW (Jim Schultz, AF6N, band captain), VHF (Robbie Robinson, KB6CJZ, band captain), Satellite and Digital (Greg Bohning, W6ATB, band captain), and GOTA (Tim Millard, N6TMT, band captain). Attending OCARC Field Day from OCRACES were Chief Radio Officer Ken Bourne, W6HK, Radio Officer Scott Byington, KC6MMF, and Martin La Rocque, N6NTH. From Buena Park RACES were Chief Radio Officer Bill Lovelace, K6MET, Alternate Radio Officer Jason Ho, KJ6VSV, and Grahame Emerson, AD6GE. They brought the BPRACES well-equipped Chevy Suburban to Field Day, and met with Buena Park Mayor Pro Tem Art Brown. 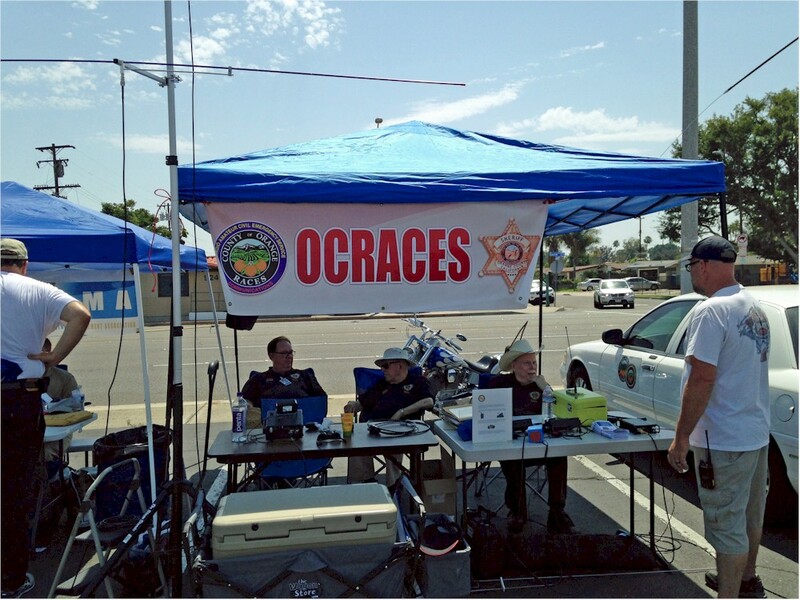 Many of the OCARC members at Field Day are also members of the City of Orange Amateur Radio (COAR), which is the city’s RACES Unit. The Orange County segment of ACS Radio Rodeo was conducted near the Santa Ana River and Angel Stadium of Anaheim (see the “Big A” in the background). Two vehicles were used for net control—OCSD’s Control 7 (left) on 2 m and 70 cm, and NI6E’s surplus news van on 40 m, 6 m, and 1¼ m.
Members of County of Orange RACES and City RACES and MOU units in Orange County gathered early Saturday morning, May 5, 2018, in a parking lot near OCSD/Communications in Orange to set up vehicular and portable stations for ACS Radio Rodeo. Setup officially started at 0800 hours, but many units arrived much earlier to get ready for the exercise. This event gave us practice in setting up for emergency communications in the field and testing our capabilities of making local contact on various bands, including 40 meters, 6 meters, 2 meters, 1¼ meters, and 70 centimeters. It also tested communications capabilities between the Cal OES Southern Region counties on 40 meters, 2 meters, 1¼ meters, and 70 centimeters. Cal OES Communications Reserve Unit (CRU) handled the roll call of Operational Areas (County RACES) in the Southern Region from its Regional EOC at the Joint Forces Training Base in Los Alamitos, on 40 meters SSB, as well as on 2 meters, 1¼ meters, and 70 centimeters, using various repeaters and linked systems. Some of the county RACES units that the REOC contacted, in addition to Orange County, included Los Angeles County, Ventura County, Riverside County (downtown Riverside and Indio), San Bernardino County, and Los Angeles County. They also communicated with the City of Los Angeles ACS. Very few contacts were made on 40 meters, due to poor propagation. City RACES and MOU units were an impressive and important part of the ACS Radio Rodeo Orange County site. Besides Peter Putnam and his NI6E van from Newport Beach RACES, we had vehicles, trailers, and portable stations from American Red Cross, Anaheim RACES, Buena Park RACES, Costa Mesa RACES (MESAC), Fountain Valley RACES, Irvine RACES (IDEC), Mission Viejo RACES, and Orange RACES (COAR). Also participating were Huntington Beach RACES and Laguna Niguel ACS. Inspection of the various stations occurred mostly during the county-to-county roll call from Cal OES. Experience the most exciting and rewarding part of amateur radio. Being a RACES member gives you the opportunity to sharpen your operating skills and technical knowledge while volunteering your services in public-safety communications. Get involved in emergency communications now. Click the Contact OCRACES link for more information. Cooperative T-Hunt. Peter Gonzalez, KC6TWS, will hide in Mission Viejo and will transmit on the input of the OCRACES 2-meter repeater immediately following the 7:00 PM net.